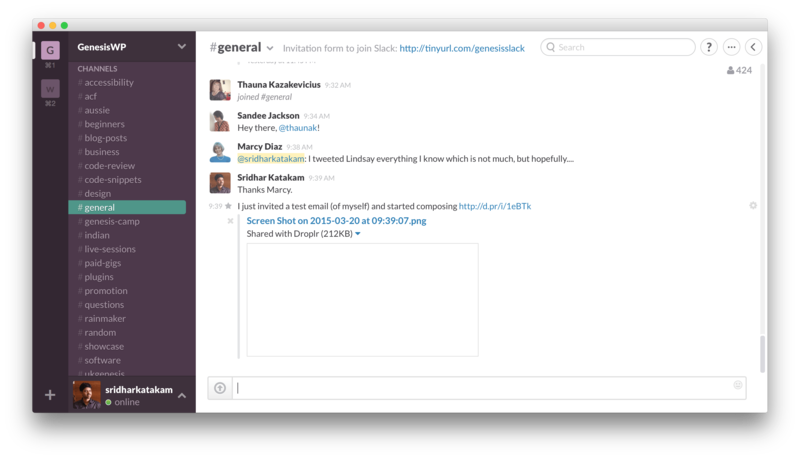 Slack is an excellent platform that offers chat rooms for groups of people called teams. We have a GenesisWP team that already has 740 members (as on 30 July 2015) made up of Genesis professionals – designers, developers and enthusiasts that use Genesis almost on a daily basis. Genesis Slack chat is not affiliated with StudioPress. Also, it is not a support forum. Here’s how you can join the GenesisWP team in Slack. Enter your email address to automatically join the team here. In the invitation email that you shall receive, click the ‘Join the team’ button. Enter your desired Username and Password and click ‘Create Account’ button. You’ll join the #general channel (room) by default (and #random channel). You can continue using your browser or better yet, install apps that are available for iOS, Android, Mac and Windows. To see the list of other channels and join them, click on +22 more… at the left side under CHANNELS. In the Browse Channels dialog, click on channel that interests you and then click the ‘Join Channel’ button at the bottom. Repeat this for every other channel you would like to join. Members also have the ability to create private groups. I’m not quite ready to subscribe “paid forum” at this moment but I’m your always-fan! Thanks for creating GenesisWP team. I’m really exciting to be part of it. The above link to request an invite is broken for me, has it been updated? Great idea Sridhar. I love Slack! And Genesis 😛 I use them both daily. Thanks for doing this Sridhar! Thanks for making this! I am so excited to get to know other members of the community! I’m having trouble with my two-step authentication. How can I contact an admin to get a manual password reset? I have disabled your 2FA. Does that help?